Since the mid-1980s, Sudan (in East Africa) has experienced brutal civil war fueled by religious, ethnic, and regional strife. Fleeing the violence and bloodshed of Sudan’s internal conflict, thousands of innocent children experienced mind-numbing horrors and intense hardship. Orphaned as young as four years old, they fled into the jungle and began walking to Ethiopia. They stayed in refugee camps there until the government overthrew the Communist Party leaders in 1991 and forced the young boys to leave at gunpoint. When they returned to Sudan, they were again met with hostility. Thus began another long walk — this time to a United Nations refugee camp in Kenya. They arrived in Kakuma refugee camp in 1992. Although hungry, frightened and weakened, their spirit of hope remained strong through their unyielding faith in God and their intense desire to become educated. Some years later, the intolerable living conditions in the camp gave the U.S. government reason to resettle some 4,000 of these young men in America. In 2001, some 550 “Lost Boys” arrived in Arizona and made it their new home. They were bright, hopeful, full of smiles, and ready to become contributing members of their new communities. While grateful for the opportunities they received in the United States, the Lost Boys still miss their home and culture. This journey began more than 12 years ago when I first learned of the plight of the Lost Boys. My interest deepened a few months later when I met a few of them at a photo shoot for the City of Phoenix. I believed I could share their struggles and triumphs in this American culture so new to them through my photography. While being welcomed into their homes, I documented their daily lives as they battled the language barrier, homesickness, grief, as well as their victories, friendships, and educational milestones. After a year’s worth of planning and preparation, I visited the Kakuma Refugee camp in northern Kenya. For six days in 2004, I walked among an amazing group of people fighting to survive. They are largely forgotten, packed away in a rarely seen part of the world but the Lost Boys of the Sudan have a story to tell. Their lives have been difficult and painful but they are resilient and strong. I hope you’ll be able to experience, if only briefly, what they feel every day of their own personal journeys. Website for Loren Anderson. With over 20 years of award-winning photography experience, Loren Anderson has the innate ability to capture the core spirit of each subject he photographs. Before the lighting is up, before the shutter clicks, Anderson’s camera is down. He takes time to listen to each individual client in order to capture every detail and nuance of the project. His attention to detail for the end photograph translates through his photography expertise. In addition to his commercial photos, Anderson is well known for his award-winning documentary work. 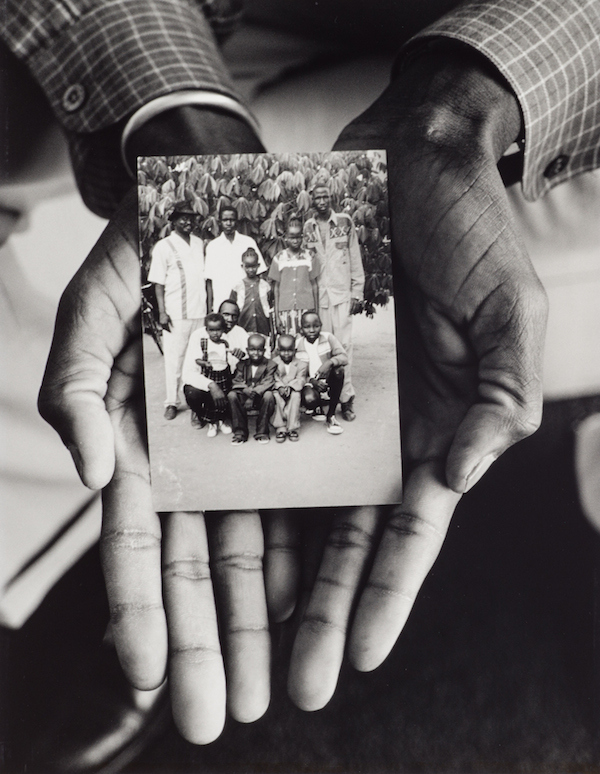 From Africa, where he documented everyday life of displaced Sudanese – “The Lost Boys of Sudan”, to Florida telling the life of migrant farm workers through the eye of a lens – “The Forgotten People”. Anderson’s integrity and professionalism has landed him on the map of who’s who in this business. Named one of the Top 50 Commercial Photographers of Arizona by Arizona Business Magazine, he has served international, national and local companies including Wells Fargo, Philips, Merrill Lynch, Arizona Public Service, the City of Phoenix, and the Phoenix Art Museum. The Arizona Lost Boys Center was originally established to assist the newly resettled Lost Boys of Sudan. More Lost Boys resettled in Phoenix than in any other city in the nation. The need for resettlement support for issues ranging from proper use of electricity and plumbing to racial discrimination was overwhelming. The Lost Boys needed to learn the language, find jobs and overcome their lack of access to education as children. Many found their struggles to assimilate to their new country compounded by issues of post-traumatic stress and childhood trauma. With a $300,000 grant from the Department of Health and Human Services in 2002, the AZ Lost Boys Center was created to become the leading national organization for addressing issues facing the Lost Boys and the only organization in the U.S. with full-time staff from the Sudanese community. The organization was considered to be the emotional and logistical center of the U.S. Lost Boys community. The work of the AZ Lost Boys Center has been featured in “The New York Times,” CNN, BBC, and Voice of America. Not only did the organization support the local Sudanese community, the AZ Lost Boys Center served as the central organization for speaking on behalf of the Lost Boys throughout the country. In 2004, more than 1,000 Lost Boys living throughout the U.S. attended a national Lost Boys conference, hosted in Phoenix and organized by the staff and Board of the AZ Lost Boys Center. The keynote speaker at the conference was Dr. John Garang, the leader of The People’s Liberation Army who was instrumental in ending the Sudanese civil war. His speech at the AZ Lost Boys Center Conference was his only public event in the United States before he was killed in 2005. Initially committed to supporting basic refugee resettlement issues, the AZ Lost Boys Center evolved into meeting the educational and employment needs of both male and female African refugees from a variety of countries by providing college scholarships, assistance in obtaining citizenship and ESL training, job placements and workforce readiness programs. American researcher Kirk Felsman recovered 14,000 Lost Boy personal history records based on interviews by field workers from Save the Children International in 2004 from a warehouse in Ethiopia. The documents were scanned and turned over in digital form to the AZ Lost Boys Center. As South Sudan celebrated its independence on July 9th, 2011, the Board of Directors of the AZ Lost Boys Center decided the organization had fulfilled its original purpose. Not content to close its doors, the community members of AZ Lost Boys Center wanted the organization to participate in the development of the newly formed Republic of South Sudan. They believed they had benefitted greatly from the American educational system and the generosity and compassion shown to them in their new country. On January 1, 2012, the AZ Lost Boys Center became the Lost Boys Center for Leadership Development. The Lost Boys Center for Leadership Development works with individuals from the Sudanese community to develop the skills and knowledge necessary to become empowered global leaders who support South Sudan. On July 9th, 2011, South Sudan gained its independence, becoming the 193rd country in the world. Shortly thereafter, The Arizona Lost Boys Center was reborn with a new mission — to help support the diaspora of Lost Boys in returning to their new country with the skills to develop education, leadership and institutional capacity. The Lost Boys Center for Leadership Development is a global, non-profit organization. Together, with leaders from the Lost Boys community in Arizona and local Arizona leaders, they have created a fellowship program and designed several unique programs that bridge South Sudan’s needs with the talents of the selected fellows. LBCLD’s effort is critical in building South Sudan as a stable contributor to Africa and the global community. The Fellowships will be granted to the Lost Boys themselves. These young men and women have grown into strong, capable and educated people with a sense of purpose to be fulfilled by paying it forward. To them, paying it forward means investing their time and talents into the future of South Sudan. The Fellows will be instituted into one of two service categories — Educational Capacity and Institutional Capacity. The fellows going to South Sudan in an educational capacity will assist with the building of schools and teaching in classrooms in urban and rural South Sudan. Those fellows in an institutional capacity will work to strengthen political and community ties that contribute to development and resource management. More than a museum, The Archives will house the 14,000 records from Save The Children, as well as documentaries, films, books, images and accounts from the Lost Boys’ lives. It will also be a central hub for peace education for the people of South Sudan. Not only will The Archives educate about the history of conflict, but it will also provide all South Sudanese citizens with the skills necessary for retaining peace: financial literacy, health awareness, women’s education and more. These skills contribute to self-sufficiency and self-confidence in individuals. These people will then promote healthy communities and a country that thrives. The Archives will be a place where the tragedies of a generation will be replaced with a future of realized potential.